Red hocks is a long bone leg deformity found in newly hatched chicks. It consists of congested vessels and stasis of blood generally affecting the skin and connective tissues of the hock. It occurs from by physiologic stress during hatching or due to impact trauma either from the side or directly along the long axis of the bone. Chicks which develop red hocks will be prone to suffering from leg weakness for the duration of their lives. Red hocks occurs commonly in modern-day "meat-type" chicken breeds (often referred to as "broilers"). Broilers have been genetically altered by the poultry industry since the 1950s to produce meat--particularly breast meat--fast. Through years and years of breeding, the commercial meat industry developed a chicken that within 6 weeks of hatching from an egg, was almost two times the size it normally should be, with 80 percent larger breast area. Red hocks is just one of several health problems and disorders that occur as a result of this unnatural acceleration in growth rate and increase in size/proportion. Red hocks is a significant welfare problem for chickens---for the disorder is very painful for the bird to use it's legs. According to a 2008 study of 50,000 chickens it was discovered that over 27 percent of the chickens had difficulty walking by the time they were 40 days of age; 3.3 percent of the chickens could barely walk. These numbers don't include the number of birds "culled" before the day of the inspection at day 40. 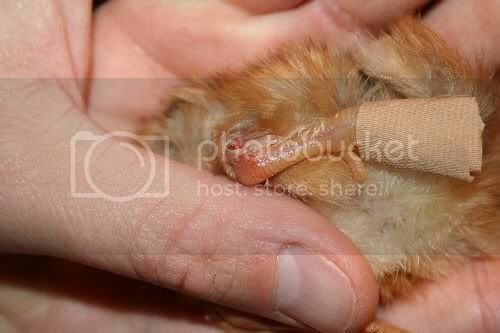 This is a condition that affects newly hatched chicks.